From now on we can look forward to cooler weather and hopefully less humidity. It will be a good thing when all of the mosquitoes have gone as well, as these make life challenging for us gardeners. In the event of rain, watch for increased pest and fungal activities, including scale, mealy bugs, lawn grubs, citrus leaf miner, snails and slugs, powdery mildew, Azalea Lace bug and others. Keep an ever watchful eye on the garden and lawns, in order to stay on top of any potential problems, or else you have the option of paying a professional gardener to do this for you. Either way, a regular stroll through the garden is a good thing. Apply Pestoil to citrus to combat scale and fend off leaf miner, also applying this to anything which may be affected by scale. Remember to apply oil sprays in the morning and not in the heat of the day. If your Agapanthus is looking I’ll right now, it’s probably a Mealybug infestation. Remove as much affected material as you can, spray with Pestoil and Confidor (as per the label). After a day you can apply Seasol, then do a follow up spray in a fortnight if required. If you just continue to water them without this regime, the Mealybug will only get worse. Powdery Mildew on roses, grapevines & strawberries is ECO ROSE. It is classed as organic and relies on direct contact with the mildew spores. It is applied in conjunction with a horticultural oil such as ECO OIL. Divide plants like Clivia. Plant and repot plants in containers. Storm or Autumn Crocus is one of the highlight plants which are out at in March, along with magnificent and long flowering Crepe Myrtles (see my album on FB). Tibouchina will be in bloom. Roses would also normally be looking good, provided they had an earlier prune and regular feeding; though if you live in an area which has had a lot of rain, you will probably have had disease problems. It’s a good time to select a Crepe Myrtle, while you can see which colour you like. While there is ground moisture and warmth it is a good time to plant out new shrubs in the garden. Perhaps there’s only warmth at the moment, in which case it’s either provide the moisture or wait until April, when it should be milder. Trim roses lightly & fertilise them now if you haven’t done so yet, so that you can have a late autumn flush. After pruning your Geraniums and Fuchsias, shove some cuttings in. Try this with many other plants and find out by experimentation what you can get for nothing. Also trim some things which may be lanky, such as Alternanthera Dentata (a taller growing and deliciously purple variety). Plant bulbs now, such as Daffodils Freesia and Jonquils, to prepare for a spring display. Also consider Hibiscus as a garden or large container planting. Check them out now as they will be looking great. They are a great addition to a tropical look garden or just as a splash of colour where it is needed. Colourful & hardy Portulaca will be growing fabulously now and will do until the cold weather arrives. If you grow them, they’ll be back next summer from their own seed. Murraya will be filling the air with wonderful perfume. If yours are grown as a hedge, consider allowing them to flower by not trimming hard in late summer. In the veggie patch: Plant Beetroot, onions, parsley, Broccoli, cabbages, Garlic cloves and seedlings of celery, kale, cabbage, cauliflower, silver beet, spring and salad onion, leeks and chives. Keep up successive plantings of lettuce seedlings & Coriander which should also fare better now than in the earlier heat. Mine tend to spring up from their own seed. I’ve been planting seedlings into pots, keeping these in a position which is shaded during the middle of the day and this has been very successful. Fertilise the whole garden using organic fertiliser including a dressing of blood and bone. Don’t forget about the Citrus right now. Be careful to not neglect watering at this stage, despite any apparent weather change. Pots especially can dry out due to neglect when you are under the delusion that everything is cooler and wet. Also, if you can, follow up watering each fortnight with Seasol & Powerfeed products combined. This give your whole garden (& lawns) a great boost. Top up garden mulch now if it is a bit thin. My favourite mulch for most situations is aged tree lopper’s mulch, which has various names at landscape suppliers. This will suppress weeds which will otherwise increase with current conditions. It will also give advance insulation against future cold weather as well as retaining precious ground moisture. 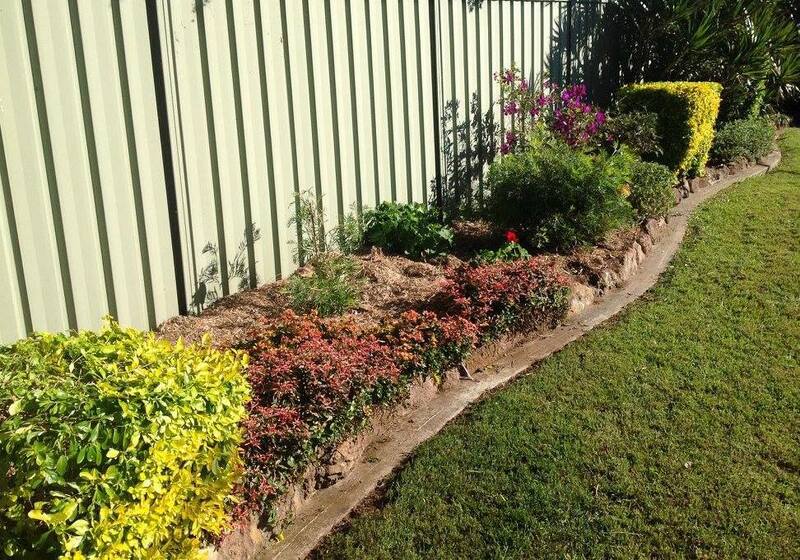 March is the time to fertilise lawns and repair sections which have died back. Don’t be tempted to mow lawns too low and hard. Mow more often instead. Look out for invasive Richardia Brasiliensis weed: (Do a Google image search). It is hard to spot and will take over before you realise it is even there. A lot of people have given up trying to get rid of it, because it seems uncontrollable. If this is a new arrival at your place act quickly to get rid of it before it multiplies by digging out well below the deep fine roots. Plonk the whole lot in the bin. It is a low growing weed which has tiny white flowers that become fine brown seeds. These could hitch a ride on shoes and mower wheels and travel to a new spot.